With an aging population and a generation of young adults struggling to achieve financial independence, the burdens and responsibilities of middle-aged Americans are increasing. Nearly half (47%) of adults in their 40s and 50s have a parent age 65 or older and are either raising a young child or financially supporting a grown child (age 18 or older). 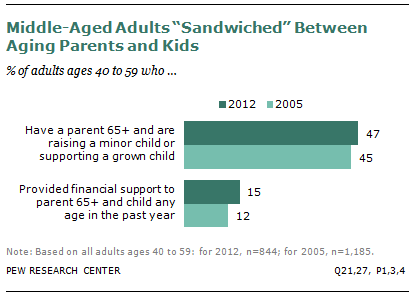 And about one-in-seven middle-aged adults (15%) is providing financial support to both an aging parent and a child. While the share of middle-aged adults living in the so-called sandwich generation has increased only marginally in recent years, the financial burdens associated with caring for multiple generations of family members are mounting. The increased pressure is coming primarily from grown children rather than aging parents. A Pew Research Center survey conducted Nov. 28-Dec. 5 2012 found roughly half (48%) of adults ages 40 to 59 have provided some financial support to at least one grown child in the past year, with 27% providing the primary support. These shares are up significantly from 2005. By contrast, about one-in-five middle-aged adults (21%) have provided financial support to a parent age 65 or older in the past year, basically unchanged from 2005.